Yesterday, Jared Bernstein highlighted a new paper on income mobility by Katherine Bradbury, from the Boston Federal Reserve, which bolsters the argument that the rate of family income mobility—the ability of families to move up and down the income scale—has been gradually diminishing for the last several decades, while income inequality has grown over the same period. This is important, Bernstein explains, because there are some who argue that the increase in income inequality in this country is offset by greater mobility—in other words, they argue that while the gap between rich and poor is widening, at least more people are able to move up and down the income scale more quickly. Bradbury’s paper has a great chart showing that this does not appear to be the case—that in fact, there appears to be a decline in the rate of mobility across the last several decades. There are various links to this chain—and this is just a hypothesis at this point (but I’ll bet I’m right). The relationship between income concentration and political power is one important link. The austerity measures we are now contemplating, the regressive changes to the tax code, the sharp cuts in discretionary spending (a part of the budget that pays for, among other things, various investments in human capital targeted at less advantaged populations)—the general and pervasive view that we a) can’t afford the investments and social insurance we need, and b) can’t raise taxes to pay for them—is not an objective fact based on analysis. It’s a political call based on power. I’ve been thinking about Occupy Wall Street, which is now occupying a number of other cities in America. What is it really about? The protesters don’t like bank bailouts; they feel the 99% have been hard done-by and they’re protesting what they see as unprecedented inequality. I think underlying their sense of frustration is despair over a very un-American state of affairs: A loss of social mobility. Americans have so far put up with inequality because they felt they could change their own status. They didn’t mind others being rich, as long as they had a path to move up as well. The American Dream is all about social mobility – the sense that anyone can make it. Zakaria also has stats. He notes this week’s TIME magazine cover story on social mobility, in which the author points out that if you were born in 1970 in the bottom one-fifth of the socio-economic spectrum, you had only a 17% chance of making it into the upper two-fifths. There are a number of reasons why we find ourselves in this predicament – but the most important of them is how much we have lagged behind on education. 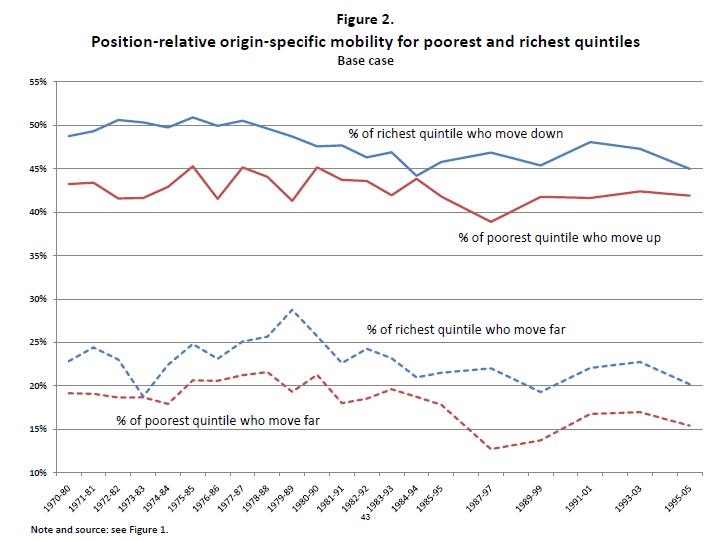 No other factor is as closely linked to upward mobility. Education is the engine of mobility (my emphasis). Everyone agrees that investments in education make sense, but what is the degree to which these investments will actually impact family income inequality absent any other reforms or changes in our economic system? Is education still the primary engine of mobility that Zakaria claims it is? Do people believe that it is? Perhaps this is discussed during the program (which I have not seen), but in his introduction, Zakaria does not get into the issue of income concentration and political power that Bernstein raises. In education we talk a lot about return on investment. You can’t get two sentences into a conversation with a pre-K education advocate, for example, before hearing about how x number of dollars invested in the system will result in y amounts of economic output. But the income inequality and mobility problem suggests to me that right now there may be a different, more relevant way to ask about return on investment in education: to what extent will our investments in education result in greater income equality and/or greater rates of mobility? If those investments are not going to do it on their own, what else needs to happen? In particular, I’m hoping that when people call for reform and increased investments in education as a direct response to these protests, they can address these questions.